Info When he was a teenager, Paul B. Higginbotham and his twin brother made a solemn vow to each other that they would spend the rest of their lives improving the lives of others and bringing equality and justice to our world. 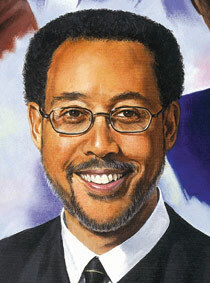 More than 30 years after his vow, Paul Higginbotham is the first African American to serve as a judge on the Wisconsin Court of Appeals. Higginbotham's journey for justice began during his childhood. His father was a civil rights leader in Columbus, Ohio, and marched with Martin Luther King, Jr., in Montgomery, Alabama, and at the March on Washington in 1963. Higginbotham remembers the bomb and death threats and the "whites only" signs at the swimming pools, water fountains and the entrance to one of the city's housing subdivisions. He also remembers the segregated junior high school he attended in Tennessee and its inadequate teaching, facilities and materials. His parents removed him from the school and placed him in a predominately white Catholic school, where he experienced racism and bigotry. While Higginbotham's high school years were very turbulent, they were also a period of tremendous growth for him. "Make your life about service. You didn't get here by yourself."